Enjoy the rugged beauty of Muskoka with all of the comforts of home. This beautiful point of land features smooth rock outcroppings sloping to the water's edge & hard sand beach. Outdoor fire pit is nestled right in the rock next to the water. The three bedroom, 1.5 bathroom cottage is close to water's edge with all day sun. Awesome sunset views of the widest point of the lake and great privacy. Open concept with hexagonal Great Room with walls of windows to the lake, beamed ceilings and floor to ceiling stone fireplace. The gourmet kitchen is a cook's dream with granite counter tops, built-in appliances (induction range, oven, microwave, dishwasher), and a stone fireplace facing into dining room. Four-post queen bed in spacious master bedroom and double bunk beds in other two bedrooms. Features cute heated Bunkie, GENERAC back up generator, drilled well, washer/dryer, propane BBQ, patio table and chairs, large dining table and eight chairs. The raised wraparound deck (2014) provides unobstructed lake views. Great lake for fishing Walleye, Bass, and Perch. *Please bring your own towels & linens. Linens available for additional fee if required. We are Colin and Stephanie; a fun, hard-working couple who live together downtown Toronto and now and then love to get away from the city noise and action to a more peaceful slice of life. Our interests include sports (Go Jays! ), live music, swimming, travelling, cooking and dining out, being the best dancers at weddings and always putting family first. We generally just love life and are very easy going people! It was love at first sight! Colin had been dreaming of owning a cottage for a long time and suddenly he found that nothing was stopping him. The property and cottage has everything one could ask for in terms of comfort, beauty, space, and that certain feeling of home away from home. Three Mile Lake has been the fishing spot among Colin and his friends for years so naturally the familiarity was an added bonus. 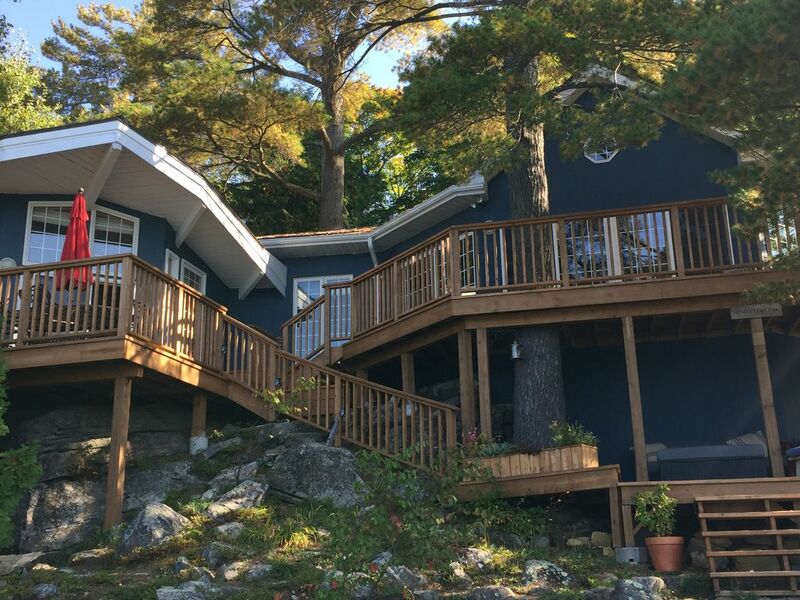 The previous owners put a lot of love and care into North Oak cottage so there are beautiful upgrades (the multi-level deck) and special features (two fireplaces!) that definitely add the wow factor! It’s hard to not become obsessed with this spot on lake; it sits on a “point” for added privacy, and the lake crashes beautifully onto the rock formations surrounding the shore. Even with boats and water sports, there is very little noise. The usual reaction so far after stepping through our front door has been a jaw on the floor- and that’s before seeing the view outside! Colin first fell in love with the Great Room and it’s extremely comfortable, relaxing vibe with plenty of room for guests and the stunning wood-burning stone fireplace. For Stephanie; it was the gorgeous wrap-around deck which seemed to flow right into the the cottage with the charming exposed wood paneling throughout the interior right up to the high-ceiling’s rafters. So cozy! The outside is wonderful for entertaining with the large patio set and barbecue or simply just swinging in the hammock reading a book. The lake is warm for swimming with nothing yucky grabbing at your feet and great for kids as the shore area is very shallow and close to the cottage. Wood burning in Great Room Gas fireplace on kitchen with remote control. Outdoor fire pit as well! Table is set for 6 people but there are additional chairs in the kitchen and one in the master bedroom. Tray can get stuck, just gently tug it a little. Dogs allowed (up to 2) no cats. Myself and my boyfriend had a wonderful time at this cottage. It's an absolutely beautiful property with everything you could possibly need. The views are stunning and the cottage itself is cozy with a rustic feel. We would definitely recommend! Beautiful property for a great fall weekend! Spent a great weekend in October at this beautiful cottage. Lots of room, very clean, beautiful sunsets and very cozy. We couldn't have asked for a better weekend.